Last weekend, my family and I went to a local orchard and picked apples. 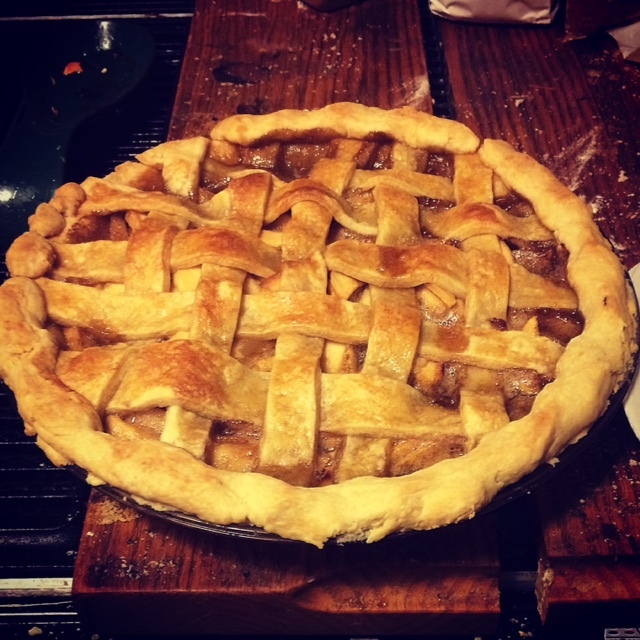 Besides being fun and delicious, it turns out that October is national apple month, which I did not know. Anyway, it got be thinking more about apples, how much the northwest produces (Washington mostly, but Oregon as well) , exports and also about the huge variety of apples out there. Plus all of this gives a nice excuse to blog some data outside our office’s core functions. I have managed to combine USDA data from a few different sources (historical data here, more recent years here). The first graph shows the amount of apples used for fresh produce or processed (dried fruit, juice, etc) along with the price farmers receive for the crop. Fresh apples are now at an all-time high while processed apples have stabilized in recent years, albeit down from their 1990s levels. 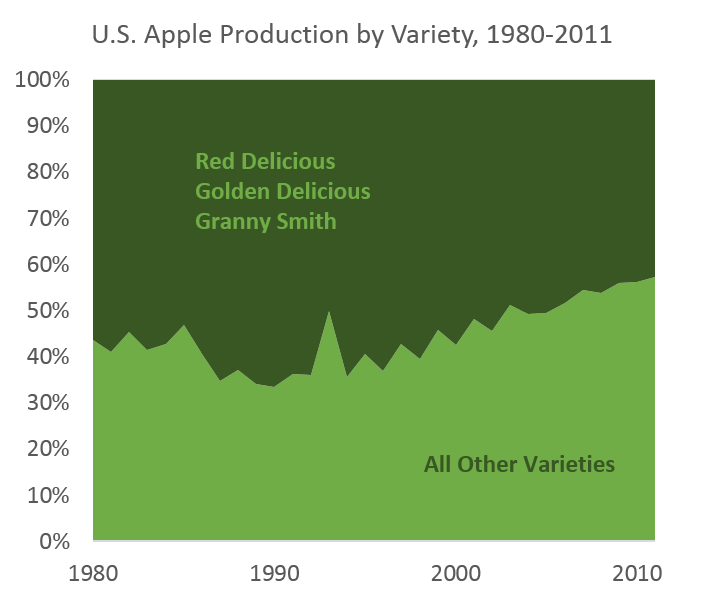 Overall, if you add the two green lines together, it shows that apple production has basically remained unchanged in recent decades, even as the composition has shifted. Prices have risen in the past decade, partly due to the mix of type of apples and their use, but also due to harvest levels, acres planted, demand for apples, and the like. In terms of where apples are produced, it’s no surprise that Washington dominates (about 60 percent of the utilized production). Oregon, however, ranks in the Top 10 and accounts for about 1.2-1.4% of the national total. According to the 2007 Census of Agriculture (see map), the largest concentrations of orchards in Oregon are in Umatilla County, a little in the Gorge, in the Willamette Valley and on the Idaho-Oregon border near Ontario. 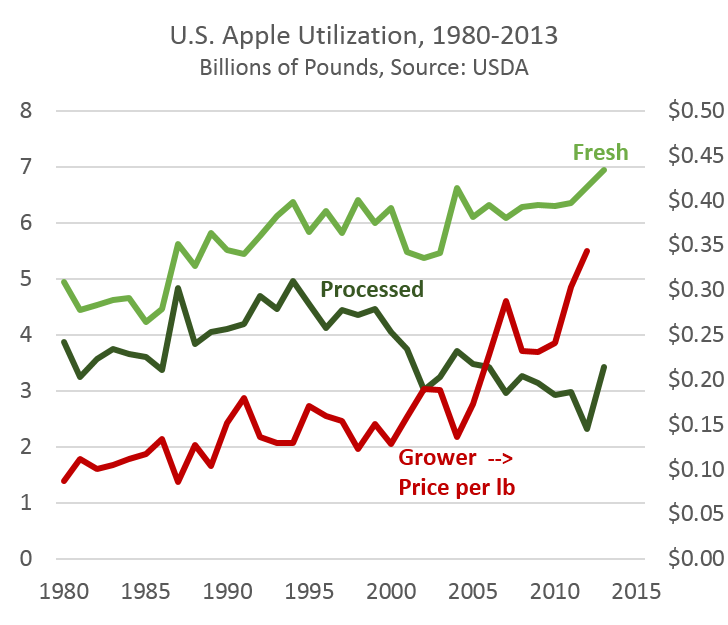 Fresh apple exports totaled over $1.2 billion in 2013, while so far in 2014 they’re slightly behind that pace. Here, Washington accounts for about 75 percent of the exports and Oregon just 0.4 percent in 2013. Fresh apple exports have increased substantially in the past decade, at least in dollar value, however it is hard to tell how much of the increase is due to higher apple prices versus more pounds actually being exported. Overall apple produciton has actually been pretty stable in recent decades, however the varieties or types of apples grown has shifted. Long-standing leaders such as Red Delicious and Golden Delicious have seen declines of 30-40 percent, while Granny Smith apples have held steady. Gains are seen in most other varieties with Fuji and Gala in particular increasing market share, so to speak. Another key feature of agricultural sector more broadly is it’s impact on local and regional economies. Way back when we first examined Portland, Seattle and the Rest, one of our working hypothesis was that strong apple harvests and higher prices helped rural Washington counties during the Great Recession. We still think this is likely one reason (plus they didn’t have a housing bubble), and it shows the importance and influence the sector has. Similarly, good agricultural harvests have helped the Columbia Gorge here in Oregon and higher wheat prices in recent years have helped Eastern Oregon as well. Lastly, one the greatest benefits of apples is that you can do this.